CC School update. B250 - Moruya Antique Tractor & Machinery Assoc. Inc. Recently, the following email message arrived and I figured it was worthy of building a page for it. 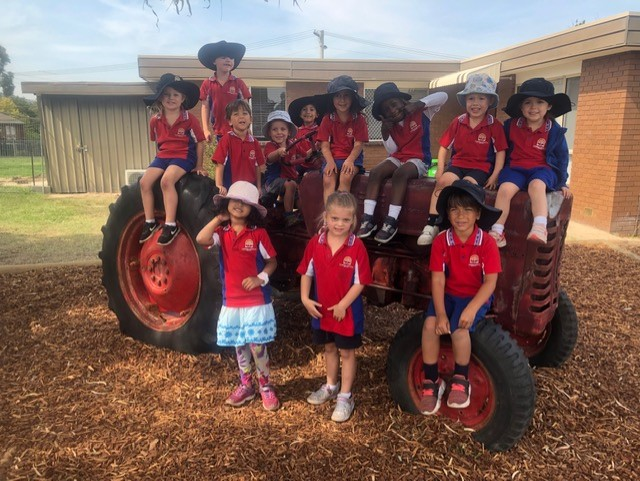 I see them having the most amazing time on the tractor every break, but never seem to have my phone with me to take a photo, so today I went out when the little ones were having their turn and said to them, "turn and look at me, I want to take a photo" and they all just lined up like a complete pose…. DAH ! Anyway I want you to know it is one of the most amazing things that you have done, as the kids and ALL the parents think it is fantastic to have in our play area. Our groundsman made sure it would not move, then boarded up a big soft fall area around it and let them at it. I’ll get another photo when they don’t know I am taking it and show you just the antics 10 or more at a time can get up to. The school teachers were almost all of one voice when they would not let us paint it. They just love the originality of it and reckon it makes more of a statement. Also our lady who does the kitchen garden, taking the whole concept from the seed through to cooking the produce after it is picked, says it is the best thing when she is describing the commercial growing and marketing of produce. So once again a BIG thank you and know it is very much appreciated.